In the 11th Century, a Monk by the name of Simeon, undertook the arduous journey from the Greek Orthodox Monastery of Saint Catherine of Alexandria, that is located at the base of Mount Sinai, in the Sinai peninsula of Egypt, to the City of Rouen. He brought with him a relic of one of St. Catherine's Fingers. The Bishop of Rouen ordered that a Church be built to house this special gift. 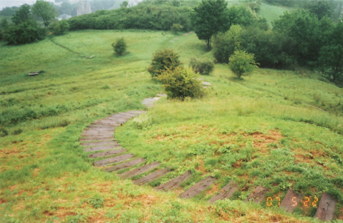 From that time until the present day, this Hill on which the Church was situated, has been known as St. Catherine's Hill. 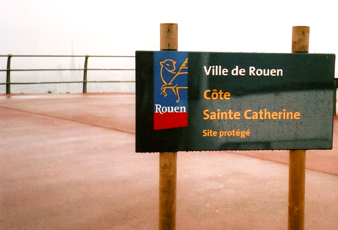 This modern day map of the city of Rouen shows the location of St. Catherine's hill in relation to the other points of interest that are found there. 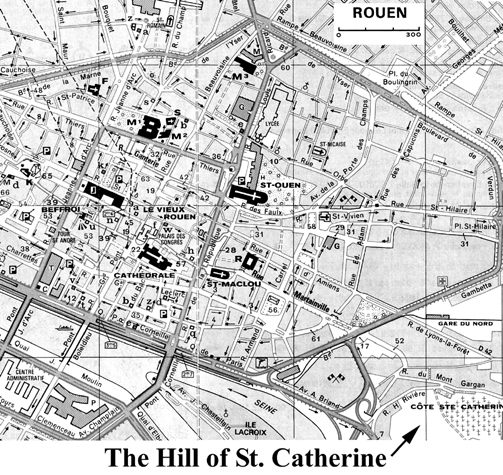 It is interesting to note that Joan's prison was only one mile from the church that held the relic of St. Catherine. 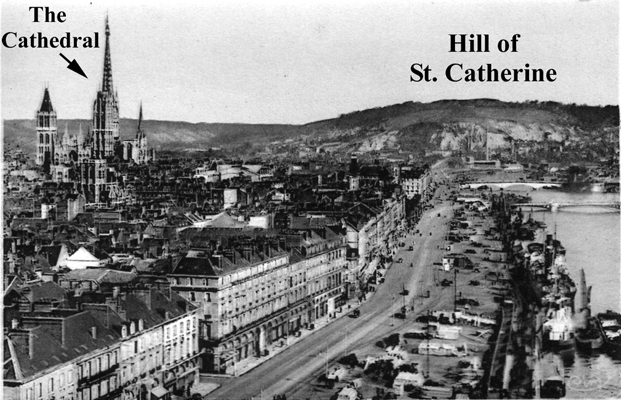 This 1891 post card shows St. Catherine's Hill and the city's Cathedral. 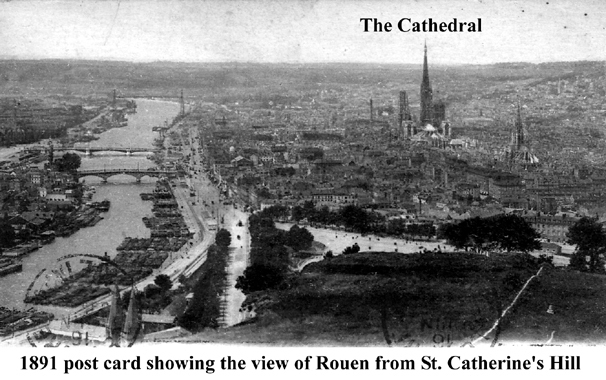 This 1620 general view of Rouen was drawn from the top of St. Catherine's hill. 525 steps will take you to the top of the hill. This is all that remains of 11th century Romanesque church of St. Catherine. The reason for the church’s destruction and when it occurred has been lost to us, as well as the whereabouts of St. Catherine’s relic. View of the city from the over look. 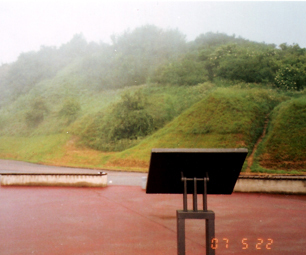 This photo shows the very top of St. Catherine's hill. All the color photos were taken in 2007 by Mr. Russell Leslie Phillips of Safed, Israel. A Thesis concerning The Mystical Marriage Ring of Saint Catherine Of Alexandria, by Russell Leslie Phillips, Diamond Grader and Jeweller, of Safed. Upper Galilee, Israel. This Thesis is to prove by purely objective and secular means, the truth of the existence of Saint Catherine Of Alexandria. At Jehanne D’Arc’s infamous ‘Trial Of Condemnation’, on the Saturday Afternoon, of March. 17th. 1431, She was asked, wether Saints Catherine and Marghareta smelled good ? She replied ; ‘It is well to know they smelled good’ ! That particular phrase ; ‘It is well to know’, is a snide way of saying , ‘Wouldn’t you like to know’ ! when the meaning is translated from the original French to English. On researching the reason for this line of interrogation, it has been suggested to me by Experts that deal with the History, Life, and Times of Jehanne D’Arc, that it was to verify if Her visions of Saints Catherine Of Alexandria, and Saint Marghareta Of Antioch, were according to Roman Catholic Religious perspective ; from Heaven or from Hell. That is to say, if they were from Heaven, then they would smell ‘Sweet’, and if from Hell, they would smell ‘Sulphurous’. I have however, discovered that the real reason for this particular question, is for a very different reason indeed. There is a very special connection between the Northern French Town of Rouen, that hosted the infamous ‘Trial Of Condemnation’ of Jehanne D’Arc, from February 21st. 1431, until the ‘In Ipse Causa Concludimus’ on May23rd. 1431, and ‘The Monastery of Saint Catherine Of Alexandria’, at the Base of Mount Sinai, in the Sinai Peninsula of Egypt, that cannot be denied. There is a very special Ceremony, that has taken place every year, since well before the Middle Ages, at Saint Catherine Of Alexandria’s Monastery, at the base of Mount Sinai, that unveils the relics of Saint Catherine Of Alexandria’s Head, and Hand, so that the visiting Pilgrim smells the sweet aromatic myhrr that exudes from the exposed Cranium. This Ceremony dates from the Seventh Century, when Monks from the Monastery that had been erected at the Base of Mount Sinai, in the Sixth Century by the Eastern Emperor Justinian, came across the remains of Saint Catherine Of Alexandria, while climbing one of the Mountains, in the Sinai range, adjacent to the Monastery. The Legend of Saint Catherine Of Alexandria, that the Crusaders brought back with them from the Holy Land, tells of her execution by Beheading, on 25th. November. 305, after the failure of the infliction of terrible tortures, by the Roman Emperor Maximinus, in the early Fourth Century, in order to obtain her renounciation of the Christian faith, after her success in converting members of his own entourage, to Christianity, during the early Fourth Century. Her Head and body was then said to have been taken by Angels, to one of the Sinai Peaks, which is today known in Sinai, Egypt, as ‘Mount Saint Catherine’. The Monks carried her body to the Monastery where it was preserved. The only parts remaining Today, are her Head and Hand. One of the Monks called Simeon, remained for seven years next to the Saint’s body praying ferverently that, part of Saint Catherine Of Alexandria’s Hand would detach itself from her Body. 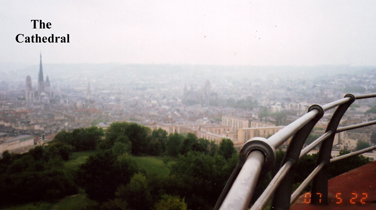 Three Fingers eventually did, from her left hand, and He took them with Him, on his Pilgrimages, to the Town of Rouen in Northern France, where it was housed in a Monastery on a Hill, outside of the main centre of Rouen, that is to this very day known as ‘Saint Catherine’s Hill’. The Fingers were reputed to have had curative effects on the Ill, that came to visit. Bishop Cauchon, and the very many Judges that presided over Jehanne D’Arc’s ‘Trial Of Condemnation’ would clearly have known about both the History surrounding ‘Saint Catherine’s Hill’, in the town in which the Trial was taking place, and far more importantly, and more to the point, they would all have been acutely aware of The Annual Ceremony of the Unveiling of the Relic of Saint Catherine Of Alexandria’s Head at the Monastery at the Base of Mount Sinai, in the Sinai Peninsula Of Egypt, because Charles the 6th. of France, had previously sent an Emissary, to the aforesaid Monastery, in 1411, together with an Ornamented Chalice as a Gift. This Chalice is still on display in the Monastery Museum, and can be viewed by any Pilgrim, today, but not however photographed. I Russell Leslie Phillips of Safed, have travelled every Year since November 2004, to Saint Catherine of Alexandria’s Monastery, at the base of Mount Sinai, in the Sinai Peninsula of Egypt, in order to undertake the Annual Ceremony of the ‘Smelling Of The Head Of Saint Catherine Of Alexandria’, together with the viewing of the Chalice Of Charles 6th. of France. My Egyptian Guide is my witness in this act. I, Russell Leslie Phillips Of Safed, do therefore likewise as did Jehanne D’Arc, before me at her Trial, attest, bear witness, and swear to the fact, that the Smell of Saint Catherine Of Alexandria, does indeed smell ‘good’, and also smells the same as the aroma of ‘Sweet Myrhh’. Bishop Cauchon together with the other Judges of Jehanne D’Arc, at Her ‘Trial Of Condemnation’, in the Northern French City of Rouen, in 1431, were doubtless aware as Clerics, of the History surrounding the Relic that had been placed in the Monastery on Saint Catherine’s Hill in Rouen, and it’s connection with the Relics in Saint Catherine Of Alexandria’s Monastery at the Base of Mount Sinai, and it was because of this that they sought to introduce this line of questioning, which was an apparent ‘follow up’, to the previous line of interrogation, on that very same day, that had concerned the composition of Jehanne D’Arc’s Ring, which She had ‘worn on her finger, and hand, when embrassing Saint Catherine’ Of Alexandria. They were obviously intent on finding out whether Jehanne D’Arc could corroborate Saint Catherine Of Alexandria’s smell. It is a specific feature of the Ceremony of the unveiling of the Relic of Saint Catherine Of Alexandria’s Head, Annually between December 5th. and December. 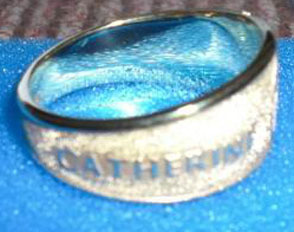 8th., that all those Pilgrims who undertake this Ceremony do receive a Ring in commemoration of this sacred undertaking. 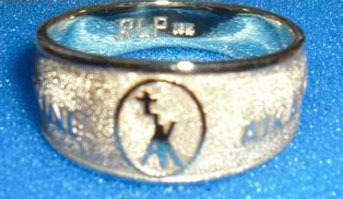 I, Russell Leslie Phillips of Safed, have created a Ring in 18kt. Yellow Gold, as a memorial to this unique event in Christendom, and have named it ; ‘The Mystical Marriage Ring’, as a rememberence of the one Saint Catherine Of Alexandria received from The Christ Child, during her ‘Mystical Marriage’ to the Child Jhesus Christ of Nazareth, which is a Historical Legend surrounding this noble Saint, and which has been portrayed by famous Artists during the 16th. and 17th Centuries. Russell Leslie Phillips, Safed. May. 23rd. 2009. La présente thèse a pour objet de démontrer, par des moyens objectifs et profanes, que sainte Catherine d’Alexandrie a bel et bien existé. Lors de l’infâme « procès de condamnation » de Jeanne d’Arc, dans l’après-midi du samedi 17 mars 1431, il fut demandé à l’accusée si les saintes Catherine et Marguerite « fleuraient bon ». Elle répondit : « Il est bon à savoir qu’elles sentaient bon ». Cette expression « il est bon à savoir… » n’était autre qu’une manière narquoise de dire « N’aimeriez-vous pas savoir… ? ». Comme j’effectuais des recherches sur le motif de cette question posée à l’accusée, des experts de la vie et de l’époque de Jeanne m’ont dit que les juges cherchaient à vérifier par là si les visions que celle-ci avait eues de sainte Catherine d’Alexandrie et de sainte Marguerite d’Antioche étaient du Ciel ou de l’enfer dans la perspective de l’Église catholique romaine. Autrement dit, si elles étaient du Ciel, ces visions auraient dû être d’« agréable » odeur, tandis que si elles étaient de l’enfer, elles auraient été d’odeur « sulphureuse ». J’ai cependant découvert que le véritable motif de cette question étaient tout autre. Il existe, en effet, une relation très spéciale et indiscutable entre, d’une part la ville de Rouen, au nord de la France, où l’infâme « procès de condamnation » de Jeanne d’Arc se déroula du 21 février 1431 jusqu’au 23 mai 1431, date de l’arrêt rendu par le tribunal (« In Ipse Causa Concludimus »), d’autre part le monastère Sainte-Catherine d’Alexandrie, qui est situé au pied du mont Sinaï, dans la péninsule du Sinaï, en Égypte. En effet, une cérémonie tout à fait particulière a lieu chaque année, depuis bien avant le moyen âge, dans ce monastère, où sont exposées comme reliques le chef et une main de sainte Catherine, ce qui permet au pèlerin en visite de sentir l’arôme de myrrhe qui exsude du crâne ainsi exposé. 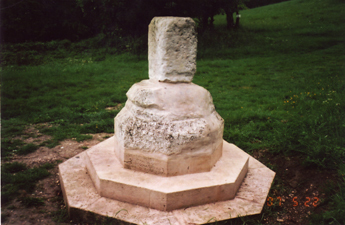 Cette cérémonie date du septième siècle, lorsque les moines du monastère – construit au sixième siècle à la base du mont Sinaï par l’Empereur d’Orient Justinien – découvrirent par hasard les restes de la sainte en faisant l’ascension d’un des monts voisins du Sinaï, à proximité du monastère. La légende de sainte Catherine d’Alexandrie, que les croisés rapportèrent avec eux de Terre Sainte, parle de l’exécution de la sainte par décollation le 25 novembre 305, après que l’empereur romain Maximianus eut échoué – en dépit de terribles tortures – à lui faire abjurer sa foi chrétienne, elle qui avait réussi à convertir son entourage au christianisme. On dit que des anges emportèrent alors sa tête et son corps sur un des sommets du massif du Sinaï, en Égypte, connu aujourd’hui sous le nom de « mont Sainte-Catherine ». Les moines emportèrent son corps au monastère, où il fut préservé. Les seules parties qui en subsistent à l’heure actuelle sont le chef et une main. L’un de ces moines, du nom de Siméon, resta sept ans à prier avec ferveur près du corps de la sainte pour qu’une partie de la main de sainte Catherine se détache du corps. Trois doigts finirent par tomber de la main gauche. Il les prit et les emporta en pèlerinage jusqu’à la ville de Rouen, dans le nord de la France, où la relique fut recueillie dans un monastère se trouvant sur une colline située hors de la ville. L’endroit est connu aujourd’hui encore sous le nom de « Côte Sainte-Catherine ». Cette relique avait la réputation de guérir les malades venus en visite. L’évêque Cauchon et les très nombreux juges qui présidaient au « procès de condamnation » de Jeanne d’Arc connaissaient forcément l’histoire de la « Côte Sainte-Catherine », située à proximité de la ville même où le procès avait lieu ; fait plus important et pertinent encore, ils ne pouvaient qu’être parfaitement au courant de la cérémonie annuelle de dévoilement du chef de sainte Catherine d’Alexandrie au monastère du mont Sinaï, car le roi Charles VI de France avait envoyé dans ce monastère, en 1411, un émissaire chargé de remettre en cadeau aux moines un calice ornemental. Ce calice est toujours exposé au musée du monastère. Les pèlerins peuvent le voir, mais non pas le photographier. Je, soussigné, Russell Leslie Phillips, de Safed, certifie me rendre chaque année depuis novembre 2004 au monastère Sainte Catherine d’Alexandrie, pour y participer à la cérémonie annuelle au cours de laquelle on peut sentir le chef de sainte Catherine d’Alexandrie et voir le calice offert par Charles VI, roi de France. Mon guide égyptien m’en est témoin. Je, soussigné, Russell Leslie Phillips, de Safed, ainsi que Jeanne d’Arc l’a fait avant moi lors de son procès, atteste, témoigne et fais serment que la relique de sainte Catherine d’Alexandrie dégage effectivement une « bonne » odeur, qui est celle de la « myrrhe douce ». En tant que membres du clergé, l’évêque Cauchon et les autres juges de Jeanne d’Arc connaissaient à coup sûr l’histoire de la relique du monastère de la Côte Sainte-Catherine, à Rouen, ainsi que la relation existant entre elle et les reliques du monastère Sainte-Catherine, au pied du mont Sinaï. Et c’est justement pour cela que ce même jour, ils ont voulu interroger l’accusée sur la composition de son anneau, ce à quoi Jeanne répondit qu’« ayant cet anneau en sa main et en son doigt, elle a touché à sainte Catherine, qui lui est apparue visiblement ». Ils tenaient manifestement à déterminer si Jeanne d’Arc était en mesure de corroborer ce qu’ils savaient de la bonne odeur de sainte Catherine. La cérémonie du dévoilement du chef de sainte Catherine d’Alexandrie, qui a lieu chaque année entre le 5 et le 8 décembre, a ceci de particulier que les pèlerins qui y prennent part reçoivent un anneau en souvenir de ce moment sacré. 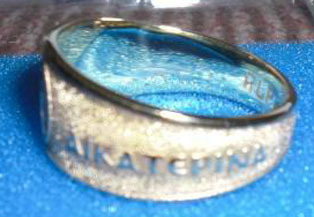 Je, soussigné, Russell Leslie Phillips, de Safed, certifie avoir créé un anneau en or jaune de 18 carats pour faire mémoire de cet événement unique dans la Chrétienté, et l’avoir nommé « alliance mystique » (« Mystical Marriage Ring »), en souvenir de l’anneau que sainte Catherine d’Alexandrie reçut de l’Enfant Jésus pendant son « mariage mystique » avec L’Enfant Jésus-Christ de Nazareth, selon la légende historique qui concerne cette noble sainte et que de célèbres peintres ont illustrée aux seizième et dix-septième siècles. Je, soussigné, Leslie Phillips, de Safed, demande ici à l’Université de Paris, France (la Sorbonne), qui a condamné Jeanne d’Arc au terme du « procès de condamnation » fait à celle-ci en 1431, d’ajouter au dossier du « procès de réhabilitation » ayant exonéré Jeanne d’Arc le 7 juin 1456, la présente thèse en tant que preuve objective et profane de l’authenticité des visions de sainte Jeanne d’Arc, outre le fait que cette authenticité a eté démontrée et consignée cinq cent cinquante ans après le « procès de condamnation de Jeanne d’Arc ». Je le demande à titre de preuve supplémentaire de l’authenticité des visions de Jeanne d’Arc en particulier, et à l’attention de la nation française en général, compte tenu de l’importance historique que ce document présente pour le peuple français au cours de cette génération et de celles qui lui succéderont. Prices given on application to Mr. Phillips.